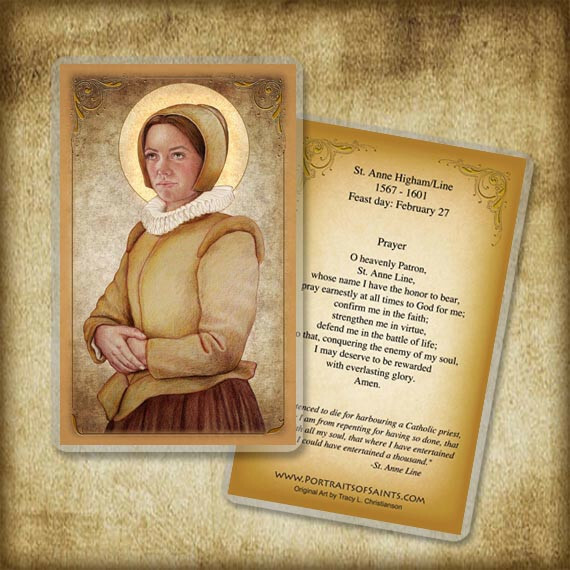 Feb 27 – St Anne Line (1567-1601), Wife, Mother, Martyr, Protector of Priests | ADULT CATECHESIS & CHRISTIAN RELIGIOUS LITERACY IN THE ROMAN CATHOLIC TRADITION: hosting ONLY True Christians!! !, or "How to think Catholic!!" Anne Heigham was born at Dunmow (Essex), England, around 1565, the second daughter. Her father was a strict and wealthy Calvinist. In her teens she and her brother, William, became Catholics and were disinherited and disowned by their family. 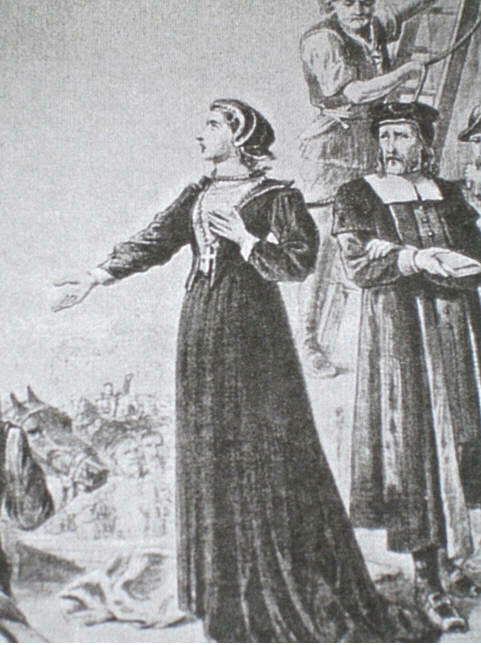 In 1585 she married another disinherited convert, Roger Line. Her husband and her brother were both arrested and imprisoned while attending Mass together. They were fined and eventually banished. This left Anne destitute. Roger Line went to Flanders, where he received a small allowance from the King of Spain, part of which he sent regularly to his wife until his death around 1594. To support herself, Anne taught, embroidered, made vestments and kept house for priests. Around the same time, Father John Gerard, S.J. opened a house of refuge for hiding priests, and put the newly-widowed Anne Line in charge of it, despite her ill health. By 1597, this house had become insecure, so another was opened, and Anne Line was, again, placed in charge. On 2 February 1601, Fr. Francis Page, SJ, was saying Mass in the house managed by Anne Line, when men arrived to arrest him, having seen a large number of people congregating at the house (for Mass). The priest managed to slip into a special hiding place, prepared by her and afterwards to escape, but she was arrested, along with two other laypeople. She was tried at the Old Bailey on 26 February 1601. She was so weak that she was carried to the trial in a chair. She told the court that she was so far from regretting having concealed a priest, she only grieved that she “could not receive a thousand more.” Sir John Popham, the judge, sentenced her to hang the next day at Tyburn. It has been argued (by John Finnis and others) that Shakespeare’s poem The Phoenix and the Turtle (Dove) was written shortly after her death to commemorate Anne and Roger Line and that it allegorically takes the form of a Catholic requiem for the couple. The poem is secretly a Catholic eulogy. This argument is linked to claims that Shakespeare was a secret Catholic sympathizer. Like Shakespeare’s couple the Lines had no children. ‘Mongst our mourners shalt thou go. Either was the other’s mine. Here enclos’d in cinders lie. St Anne Line Societies are being formed in parishes around the globe for both men and women to assist, support, and pray for our priests. hildless couples. St Anne Line, Protector of Priests, pray for us!